If you’ve caught a glimpse of the news these past several weeks, you likely know a record-breaking number of political ads were purchased during this general election season than in any previous midterm. When it comes to elections, local TV is a key player in how politicians reach constituents to drum up support for their campaigns and to overall encourage voters t o visit the polls on election day. 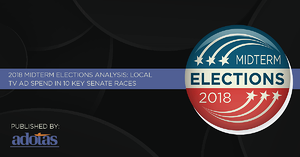 We thought it would be interesting to assess the value each major party and their respective candidates placed in local broadcast for these purposes, so to do this we analyzed more than $256 million worth of political ad sales from senatorial candidates in the 10 toss-up states for the duration of each state’s 2018 general election campaign.